Some Personal and Family Welfare Goals: What Can I Do Now? My dear brothers and sisters: my wife, Barbara, our family, and I express to you our deep appreciation for your messages of love and support since my call last October to the Council of the Twelve Apostles. All of my life I have held the Apostles of The Church of Jesus Christ of Latter-day Saints in great esteem. From the early days of my childhood, the term Apostle has been one that my father and mother used with deep reverence. Since my ordination to this special calling, I have had many hours to ponder the sacred responsibility that now rests upon my shoulders. “Now, I say unto you, and what I say unto you, I say unto all the Twelve: Arise and gird up your loins, take up your cross, follow me, and feed my sheep. Twelve days ago I returned from South America, where I had visited the people of Uruguay, Argentina, and Colombia. Last December, I visited Peru and Brazil. Reflecting upon these two recent assignments, I observed the dramatic growth of the Church among these people. The words “by the authority of the holy apostleship” have special meaning to me now as my ministry bears that same authority to accomplish the purposes of our Heavenly Father. The original recorded history of the three General Authority missionaries who visited Buenos Aires in 1925 was found there a few days before my arrival this last March 14. I read with great interest of the extreme difficulties that they encountered. The trip from Salt Lake City to Buenos Aires for Elders Melvin J. Ballard, Rey L. Pratt, and Rulon S. Wells was by land and sea, taking thirty-four days. In comparison, my recent trip covering the same distance took twenty-one hours. There were only four members of the Church in South America in 1925; they greeted the missionaries upon their arrival. To conserve resources, the missionaries rented one hotel room to house all three of them. They moved several times until they finally located a low-cost apartment in which the three of them could live. Efforts to advertise the first public meetings in the Buenos Aires newspapers were fruitless. The newspapers refused to print an ad. Elder Pratt prepared a handbill in Spanish. Elder Ballard, who spoke only English, distributed these handbills each day. 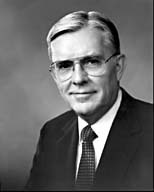 Elder Pratt spent most of his time translating doctrine and hymns into Spanish. Elder Wells, who spoke German, became ill and returned to Church headquarters shortly after his arrival in Argentina. My brothers and sisters, it is difficult to express my feelings as I read of the early beginnings of missionary work in South America. I am deeply touched to realize that for nearly eight months my grandfather walked the streets of Buenos Aires giving out two hundred to five hundred handbills every day but Sunday, inviting the people to learn the message of the Restoration. Sixty years later, the Church in South America has 30 missions, with 5,140 full-time missionaries, of which approximately 60 percent are natives of South America. One hundred eighty-six stakes cover the land, with 2,148 wards and branches dotting the countryside. Approximately 776,000 members of the Church are an evidence of the fulfillment of the dedicatory prayer. At the regional conference last month in Montevideo, President and Sister J. Thomas Fyans and I met with 3,350 Saints. President and Sister Helio R. Camargo and I met with more than 3,100 Saints in Bogota, Colombia, the following Sunday. The work is prospering in this part of the Lord’s vineyard. The effective work of the General Authorities of the past and of those of today is evidenced in the faithful lives of the Saints. Thousands of missionaries have served with distinction. Dedicated men and women are leading the Church in their own countries in a magnificent way. It is a joy to see second- and third-generation members living worthy to be leaders in South America. The gospel of Jesus Christ radiates in the faces of the Saints. They express faith and commitment and love for the Lord. They are seeking to be worthy of the full blessings of the gospel. Several Aaronic Priesthood boys dressed in their Scout uniforms greeted me in Bogota. Without hesitation they all told me they will serve as missionaries as soon as they are old enough. With such a spirit, the future of the Church in South America will be in good hands. I visited the temple in Buenos Aires. Feelings of gratitude welled up within me to know that within the four dedicated temples of South America the fulness of the gospel is blessing the members of the Church. An example of the marvelous commitment of the Saints of South America was demonstrated by the dear sisters hand crocheting sixty-four altar cloths for the Buenos Aires Temple when only seven were requested. My dear brothers and sisters, as a member of the Council of the Twelve, I now know as never before that we live in a big world. Nearly five billion of our Heavenly Father’s children live on it. The responsibility of taking the gospel to them rests upon our shoulders. I am impressed, as I now start to see the larger picture, that the stake presidents must take more of the responsibility for preparing their people to receive all the blessings of the gospel. Bishops and branch presidents must do likewise. Our work is not complete until our Father’s children enter the temple to receive all of the necessary ordinances to prepare them for celestial living in the presence of our Heavenly Father and His Beloved Son, Jesus Christ. Teaching and preparing the members of the Church to be worthy of the temple blessings rests upon the shoulders of the priesthood. There is no substitute, in my opinion, for inspired local leaders. I was most impressed with the conversion stories told by the stake presidencies in Bogota. One stake president, who has served for more than eight years, reported that he was called after only two and one-half years of membership in the Church. The Lord does bless his leaders when they put their trust in him. It seems clear to me, as this great work continues to roll forth, that the leaders of the Church at every level, and particularly at the stake and ward levels, need to understand God’s plan for his children and then teach these principles to their people. In my judgment, the greatest motivator that we have in the Church is to have Church members understand the plan of salvation. Stake presidents and bishops, you are the key to having your members come to this understanding. Every leader should strive to motivate the people to good works by teaching the doctrines of the kingdom. The scriptures are our text, for “in them ye think ye have eternal life.” (John 5:39.) From them we glean the truths that will open to us a clear understanding of man’s eternal possibilities. I very humbly commit to you, my dear brothers and sisters, that in my calling as a member of the Council of the Twelve, I will do everything within my power to teach the plan of our Father in Heaven for the redemption and exaltation of his children. I will strive to clarify the truths that can provide eternal life for the sons and daughters of God. I pledge to the First Presidency and to you that I will so live that if I ever should be sent to unlock the way for the restored gospel to enter a nation of the earth, I will be prepared the way the first missionaries were when they dedicated and blessed the lands of South America. We are living in a most exciting time. What a joy it is to know that the power of the holy priesthood is operating throughout the Church to bless the lives of the Saints. It is wonderful to know that the priesthood vested in the latter-day Apostles has, in this dispensation, opened many nations to the preaching of the gospel. Surely in the future we will see other nations opened in the same remarkable way. I testify to you that Jesus Christ is the Only Begotten Son of our Eternal Heavenly Father. He is our Savior, our Redeemer, our Friend and Brother. I love him with all my heart and count it the greatest privilege that could ever come to a man to be a special witness to his name throughout the world. May the Lord bless us, my brothers and sisters, in doing his work, is my prayer in the name of Jesus Christ, amen.